This months box consisted of 3 bags of treats and 3 toys. 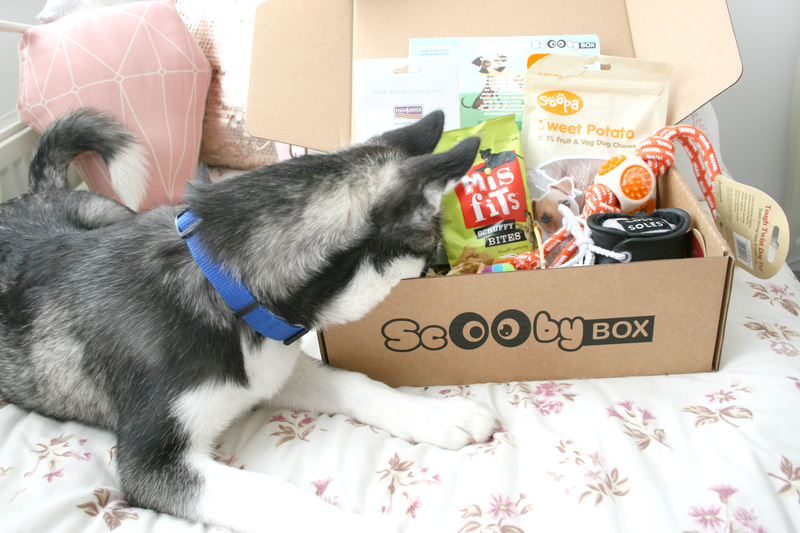 ScoobyBox varies in prices depending on the subscription you chose, however they do a 1 month box so you can try it out and see if you like it. For more information and prices you can check out their website here. Like last time you can use the code 'DARLING' to avail of 25% off your subscription! 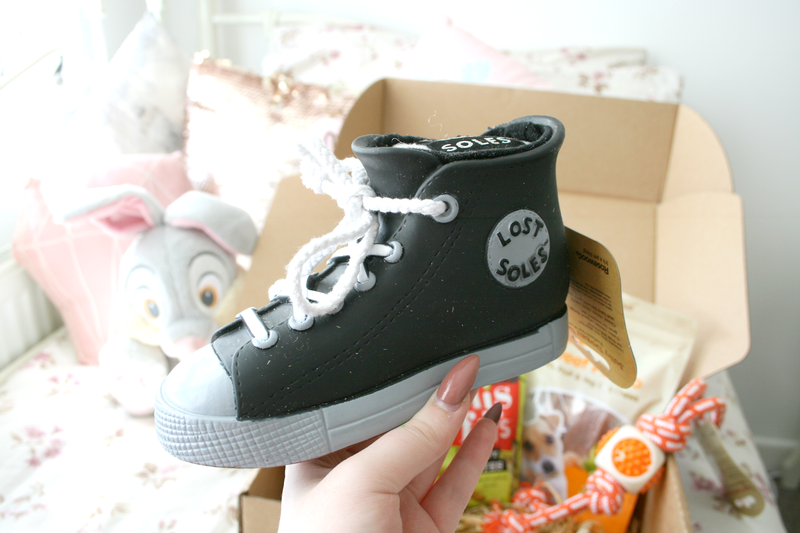 Starting with toys, the first thing included was the Lost Soles Shoe. This toy is bloomin genius! Aragón is forever robbing our shoes and trying to chew them so now he has his very own that he can chew on to his little hearts content! The top lace is real so he can pull it apart and there is also a squeaker inside the shoe which just gets him excited to play with it. 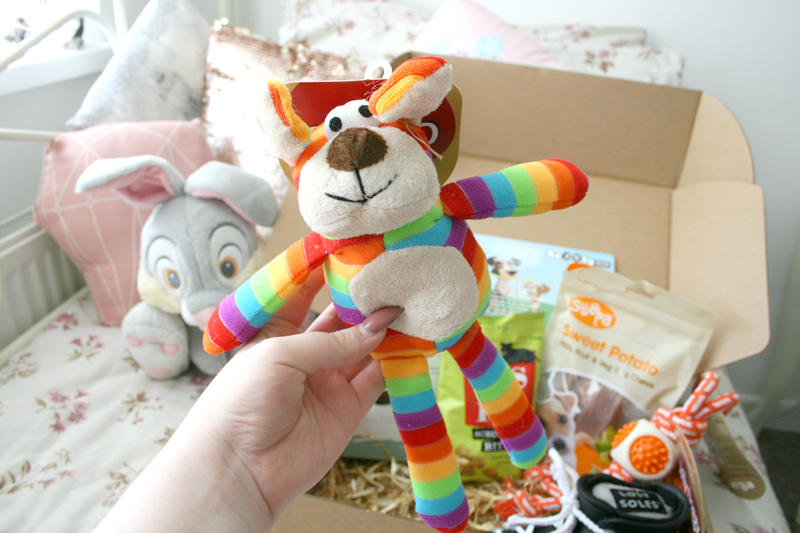 Can we talk about how cute this teddy is!? I mean it's bloomin adorable!! One thing I've learned about Aragón is he's a teddy kinda guy..well dog. Seriously he has so many teddys and adores every single one of them so this one was no exception. This was actually the first thing he went to immediately when I opened the box beside him. Again he also has a squeaker inside and I'm kind of obsessed with how cute and colourful he is! Finally the last toy included was a tug of war rope. I mean what dogs collection isn't complete without one of these!? I was actually so glad this was included because Aragón only had a mini tug of war rope and it was getting a little small, at first when he was a much smaller puppy it was fine but now that he's took a jump this is definitely more suitable. When he picks this up he literally wants you to play with him for hours upon hours. Now onto treats. 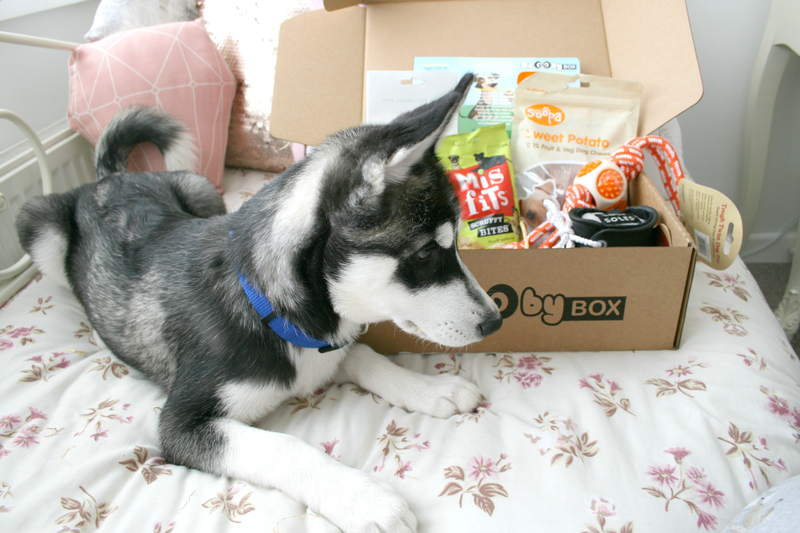 Something I love about ScoobyBox is that they introduce you to brands you may not have known about before, everything they've included so far are never in my local pet stores so I really like getting different ones for Aragón to try. These Soopa treats were new to me and by the looks of peoples boxes everyone got different ones. 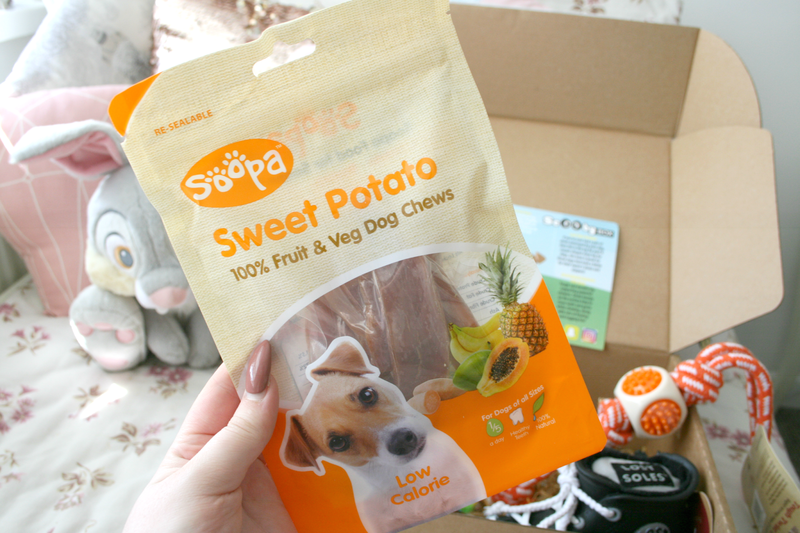 Inside Aragon's box were the Sweet Potato chews and he absolutely adores them! They are chewy meaning he has to take his time eating it and it also takes him a good 6 minutes to get through it, perfect for when you want him to settle down for a few minutes of peace and quiet! 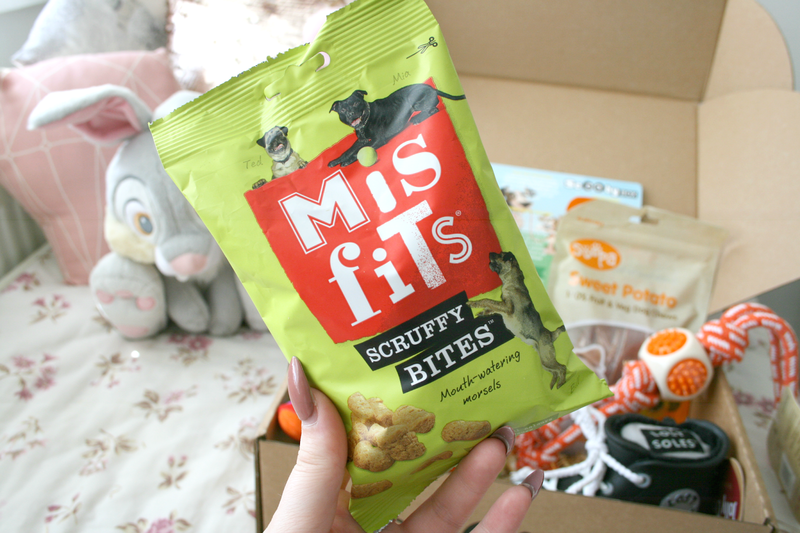 Also included in this months box were the Misfits Scruffy Bites, again I think there was a few different packets of these but Aragón definitely approves of the Scruffy Bites. They're a soft chewy treat that he goes crazy for. It's gotten to the stage where he has so many treats one of the drawers in the kitchen is starting to overflow with them all! I also must say I really love the fun packaging of this brands products and they're all for giving your dog the best of the best. 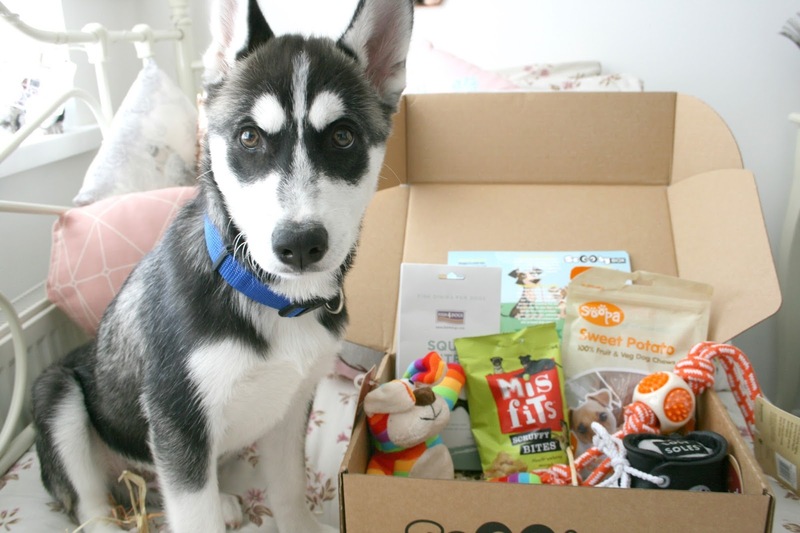 They featured Fish4Dogs in the last box and Aragón went crazy for the treats! 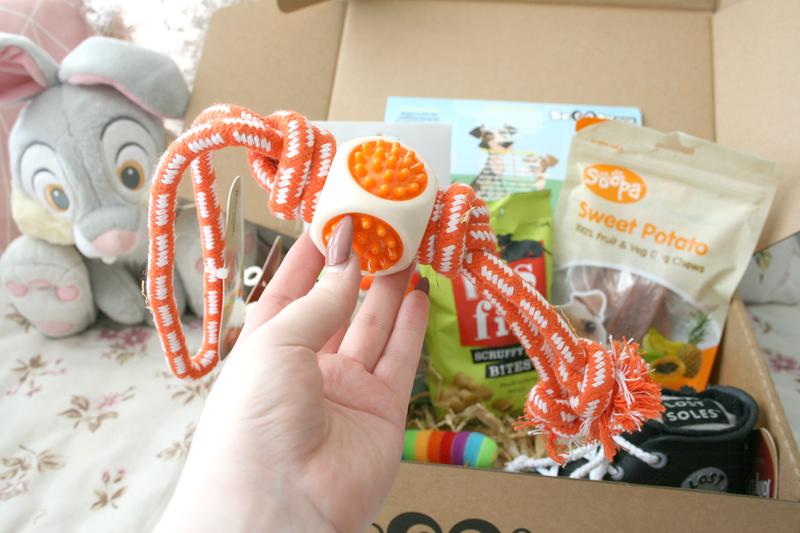 I really love this brand and actually ordered some treats from their website as their good for your dogs coat, health and joints which I really like the idea of! 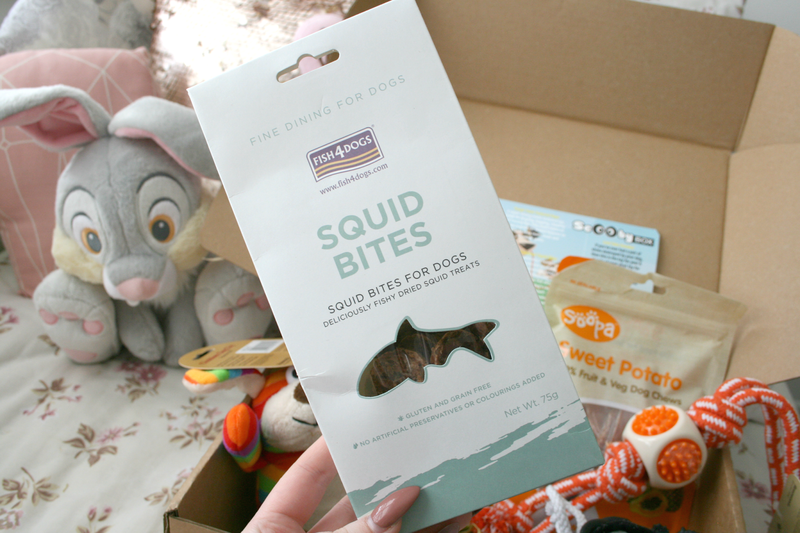 This time around the treats included are Squid Bites, now I will say these are so strong smelling but again Aragón goes absolutely crazy for them and I definitely think these are his favourite treats again in this months box. Definitely can see him loving anything this brand brings out to be honest. This month was really the test month for me, last month I was all excited because it was the first one I ordered and so it was all new. However they didn't let me down at all and I've decided to stay subscribed to the box because I'm really and truly enjoying getting them every month and think you definitely get your moneys worth. Also its so nice to see how excited Aragón gets when he sees me carrying it because he knows it's his. And there you have it, everything in this months ScoobyBox. If you're interested in spoiling your pooch next month don't forget to check out their website here and if you want to avail of 25% off just enter 'DARLING' at checkout to save some pennies! 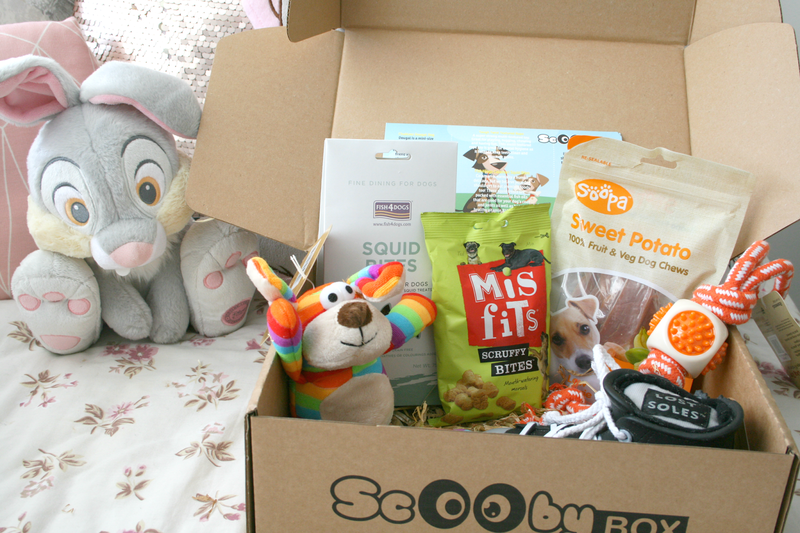 ScoobyBox is available for all your pooches living in Ireland and the Uk. Is this something you'd be interested in treating your pooches too?